Autonomous autos are advancing so rapidly that companies like Uber Technologies Inc. and Alphabet Inc.’s Waymo are beginning to offer robot rides to everyday consumers. But it turns out the traveling public may not be ready. A recent survey by the American Automobile Association found that more than three-quarters of Americans are afraid to ride in a self-driving car. 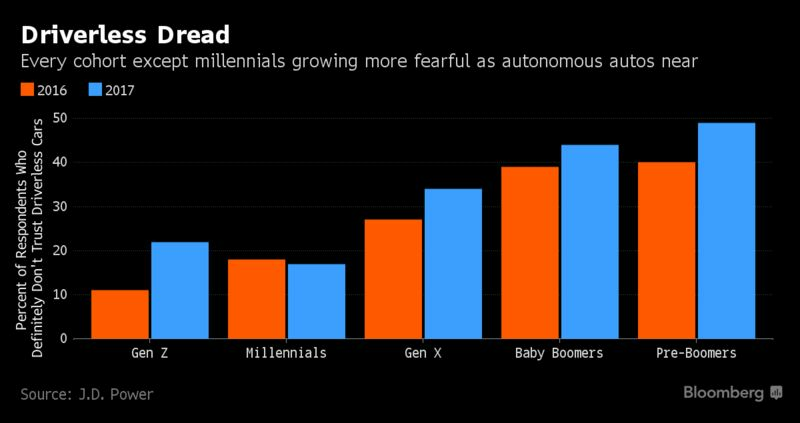 And it’s not just Baby Boomers growing increasingly fearful of giving up the wheel to a computer, a J.D. Power study shows — it’s almost every generation. Dangerous as it may be to operate cars themselves, many drivers are anxious about autonomous technology because they associate it with the fragility of electronic devices. Laptops crash and calls drop with nagging regularity. The consequence of a computerized car crash is much greater. Americans tend to like technology: we like progress and new and exciting options. Is the fear related to safety or also connected to how Americans view driving (despite all the hours spent commuting and stuck in traffic, Americans like the freedom it offers)? I’m guessing this fear will drop within a few years as stories of mishaps become normal (and even the occasional mishap would be safer in the long run compared to the tens of thousands of Americans killed each year in vehicles) and the technology improves. Could we also imagine a scenario where governments impose self-driving vehicles because of their improved safety? “There appears to be nothing uniquely ‘rational,’ objective,’ or ‘truth-oriented’ about the activities that our society calls ‘scientific.’ Make no mistake: it is not that scientists are less rational than the rest of humanity; rather, they are not more rational. STS researchers generally credit ordinary people with a good deal of intelligence. “The power of science seems to rest on three pillars. One is science’s distinctive social organization, which enables concentrated periods of both teamwork and criticism, nowadays done on a global scale with considerable material resources. Another is concerted political effort to apply the results of scientific research to all aspects of society. Finally is the control that scientists continue to exert over how their history is told. Past diversions and failures remain largely hidden, resulting in an airbrushed picture of ‘progress’ otherwise absent from human affairs. Especially in today’s world, we could use more sociology of science. Without some questioning, science tends to get a free ride in American society as one of the key promoters or carriers of progress. Yet, science is still a social enterprise and works with its own set of assumptions. One question: where can you have reasonable discussions about science (natural and social) and its assumptions and findings? One could argue that these social skills made other technologies possible. It provided a social infrastructure. Imagine trying to large social groups without bureaucracy. While it often gets a bad name today, you couldn’t have the Roman army or city-states or the modern welfare state without bureaucracy. I’m a little surprised that language isn’t included here – writing makes it but perhaps language predates the beginning of this list. It is also intriguing that economics and political science make the end of the list – perhaps this betrays the opinions of the author but few other academic disciplines make the list. Research indicates that almost half of all toddlers up to two years old have played with a mobile device. It also reveals that 15 per cent of that group can also operate a home entertainment system. That rises to 31 per cent of three- to five-year-olds and a third of six- to eight-year-olds. The study of 750 adults across Australia who have an internet connection included questions about how children interact with technology and was conducted by media intelligence firm Magna Global. Jordy Kaufman, a child psychologist and founder of the Swinburne BabyLab, has studied how children interact with devices. ”Given the massive uptake of mobile device use by young kids, we can be said to be engaged in a grand sociological experiment where no one knows what the results will be,” he said. But he cautions that just because we do not know the outcome, that does not mean the use of devices is negative. There are opportunities for learning from iPads that did not exist before, Dr Kaufman said. I suppose there are three possible reactions to the situation. Go all in and see the use of mobile electronics as simply part of the progress of the modern world. Americans tend to like progress and new opportunities and these devices certainly fulfill these two requirements. This full usage may occur even with evidence that they don’t contribute much to learning. The opposite reaction is to not allow children access to such devices. To some degree, this is helped by the fact that such devices are not yet completely ubiquitous. But, some may want to wait and see how children respond to mobile devices. And, there is some middle ground where children could use new electronics in moderation alongside more “traditional” activities. It sounds like we need some sort of randomized experiment to help figure this out. But, we are getting close to a time where it would be really difficult to pull this off.